Pimsleur. The Art of Conversation. Down to a Science. Russian Levels 1-3 (90, 30-min. daily lessons) Software + mobile app with interactive tools: Audio lessons teach speaking, understanding, and reading. Review tools include digital flash cards and Quick Match quiz, and Speak Easy conversation practice. • And with the Quick Match interactive phrase game, you get 300 questions to challenge you. • 30 light bulb moments to connect culture and history to your language learning. Over 50 years ago, Dr. Paul Pimsleur developed a method that transformed language learning. Since then, millions have used this system to begin to speak and understand a new language quickly. You can too. With Unlimited mobile, you learn fast as you roam free. Still only 30 minutes a day, Pimsleur Unlimited is completely portable, and audio lessons are hands-free; you can do them in the car, at the gym, or while out for a walk. Lessons sync across devices, so while you’re free to ramble, the app keeps your language learning firmly on track. Digital flash cards and the Quick Match interactive phrase game provide listening and reading practice and review, and Speak Easy conversations help you to engage with the language. They pull you into the culture, fixing rhythm and intonation in your mind, and helping you to develop a near-native accent. Every course is painstakingly crafted to highlight and explore the culture where your new language is spoken. Pimsleur Unlimited features high-res photos with light bulb captions that delight and inform, and covering everything from art and architecture, to festivals, history, vivid landscapes, and cultural curiosities. This program includes all of Levels 1, 2, and 3. With this program you start from zero, first learning survival phrases and vocabulary, and eventually progressing to a high-intermediate level of speaking and understanding. Every lesson contains an introductory conversation and isolated vocabulary and structures, as well as full practice of all vocabulary introduced. The emphasis is on pronunciation and comprehension to promote proficiency. At the completion of this program, you’ll be speaking and understanding with near-fluency and with impressive conversational skills. This course will expand your vocabulary, encourage you to share your opinions and interests, introduce you to less formal conversations, and help you to venture out to new travel destinations. You’ll learn to share your impressions and opinions, describe people and places, and convey your preferences. Reading Lessons are included for each level. In Level 1, you'll learn to sound out words then phrases and sentences. In Levels 2 and 3, you'll continue to practice reading, improve your pronunciation, and learn new vocabulary. Before you know it, you’ll be reading with the ease and flexibility of a native speaker. Reinforce what you’ve learned quickly and effectively with flash cards. Created to help you practice the most-essential vocabulary, the cards contain words and short phrases from the daily audio lessons. The Quick Match interactive phrase game will help you to challenge yourself with longer phrases and sentences in a fun and fast-paced way. Brush up, or dive deep — it’s all up to you. Experience language learning like never before. Pimsleur Unlimited: easy, engaging, and fun. Russian, one of the six official languages of the United Nations, is the official language in Russia, Belarus, Kazakhstan and Krygystan, with an estimated 150 million native speakers around the world. 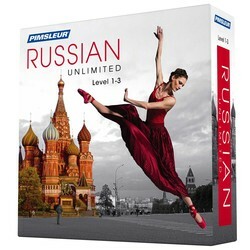 Pimsleur's Russian uses speakers from Moscow and St. Petersburg, which accounts for slight pronunciation differences between speakers, but accurately depicts contemporary spoken Russian. Pimsleur Unlimited is designed for use by one registered user, plus up to three household members, and may be installed on up to four devices. Pimsleur Unlimited runs on MAC or PC computers, and on mobile devices for iOS and most Androids.